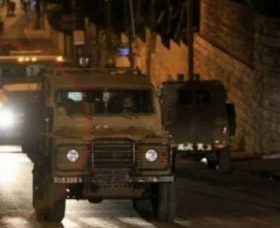 Israeli soldiers invaded, on Monday at dawn, Beit Fajjar town, south of the West Bank city of Bethlehem, and kidnapped three young Palestinian men. The soldiers invaded the town through its western part, and were largely deployed in the Western Neighborhood and Sahlet Eid area, before storming and searching many homes, and kidnapped three young men. The kidnapped Palestinians have been identified as Hasan Mahmoud Taqatqa, Anas Mohammad Taqatqa and Mo’taz Jalal Thawabta. The soldiers also fired several gas bombs, and concussion grenades, before withdrawing from the town. In related news, the soldiers have kidnapped, late on Sunday at night and on Monday at dawn, eight Palestinians in different parts of the West Bank.